"Usinando peças maiores utilizando a máquina #30"
A liberação do centro de usinagem S1000X1 reflete uma substituição nas áreas de usinagem convencionais das máquinas #30. Increase in X- and Y-axes travels and expansion of the machining area have enabled large workpiece machining and large jig mounting, which were not possible on conventional #30 machines. Compared to a machining center with the same machining area, Brother's original high-speed and optimal operation control results in overwhelming high productivity. 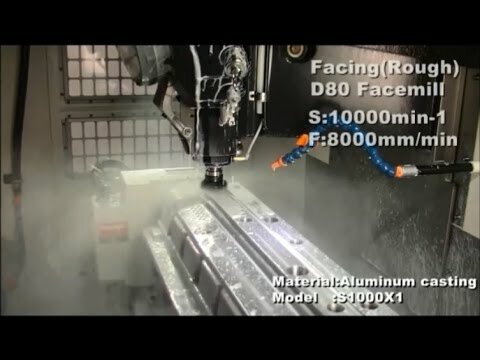 Chip discharge performance has been improved along with the expansion of the machining area. In addition, the machine is equipped with a variety of functions, such as air-assisted tool washing, to improve reliability. In addition to low power and air consumption, the machine is equipped with a power regeneration system and a variety of energy saving functions, achieving high environmental performance. For machining industries in Automotive parts, Motor cycle parts, Information Technology parts. Guia de descarregamento do catálogo dos produtos de última geração. Contacte para reparo ou manutenção do produto. Contacte para informação, desenvolvimento, ou utilização do produto e pontos de venda regionais. Este site utiliza cookies. Ao continuar para o browser, aceita a nossa Termos e Condições.